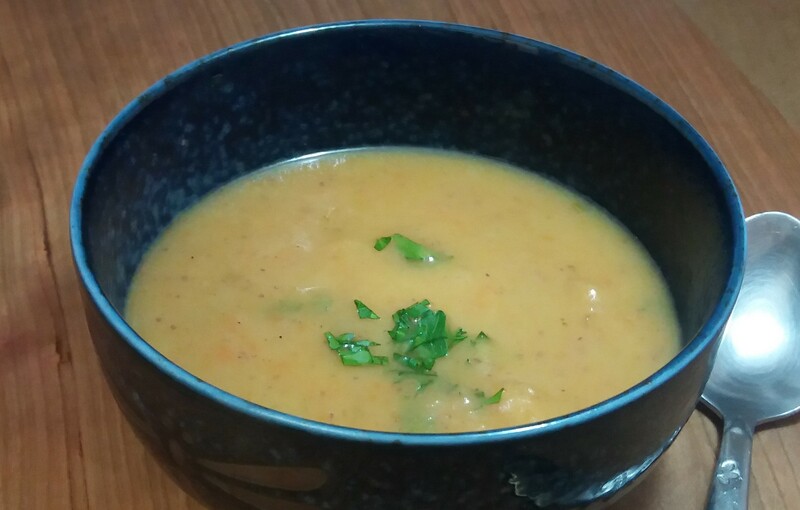 On those cold winter days where you just do not want to leave the house, this is a delicious soup will make you want to curl up on the couch with as not only will it warm your hands as you hold the bowl, it will warm and sooth your insides as well. Place a soup pot over medium heat. When the bottom of the pot is warm, add the oil followed by the onion. Add a pinch of salt and stir so the onion is coated with oil. Let sauté for a few minutes. If using dried herbs, add generous amounts of oregano, rosemary and sage and stir into the sautéed onion. Layer the potato followed by the carrot. Fill the pot with water such that it just covers the potato (feel free to adjust the amount of water – less will make a thicker soup). Bring to a boil and then turn down the heat. If using fresh herbs, add the sprigs now to the water. Simmer for 30-45 minutes. If using fresh herbs, remove the sprigs from the pot. Using a hand blender, blend the soup mixture. Add salt to taste. Let simmer 2 more minutes. Serve. optional addition: To make extra rich, serve with deep fried croutons or roasted diced potatoes, which will give the soup a really nice texture.